Wheat farmers in New Zealand's breadbasket fear losing some of their crop stored in at least 38 silos that were split or toppled in Saturday's earthquake, Federated Farmers has warned. “Silos may look secure, but seams can open up and let water in. And then the grains expand and explode," Federated Farmers Spokesman David Broome said. “Grains are now a major concern. Canterbury is the breadbasket for New Zealand. And now we have the rains rolling in,” Broome told interest.co.nz. 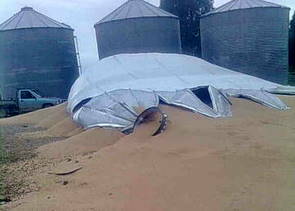 Federated Farmers Grain and Seeds Chairman Murray Rowlands urged farmers to check silos thoroughly, and contact him if there was damage. He said many farmers would incorrectly assume their silos were covered under the sundry buildings clause in their insurance cover. However, unless the silo is specifically identified along with its value, they are not covered by insurance. “And these silos can be worth up to NZ$40,000. One fell down that had 140 tonne of grains in it,” he said. Rowlands said silos are currently full because local mills have been using grain from overseas, forcing farmers to store their harvest. Following the earthquake Federated Farmers unsuccessfully approached some mills to ask for an increase in the use of local grain, said Rowlands. “They’re not interested in helping the local guys out at all,” he said. Builders were urgently needed to check silos. The New Zealand Flour Millers Association could not be contacted as its central Christchurch office is still cordoned off. Goodman Fielder Spokesman Ian Greenshields said the company's New Zealand mills used a mixture of both Australian and New Zealand grain and there would no problems expected supplying bread. Goodman Fielder is New Zealand's biggest bakers of bread with the Vogels, Molenberg, Country Life and Freyas brands. The North Island mill in Mt Maunganui uses Australian grain, while the Christchurch-based Champion Flour Mill uses New Zealand grain. It produces around 60% of New Zealand's flour and cereal based products. The Christchurch mill is currently closed with limited damage, but will reopen in the next two or three days, Greenshields said. He said any spoiled wheat will have no effect on the company's supply of bread, as no Goodman Fielder silos were damaged and the company has a week's worth of flour in storage. On dairy farms, numerous cowsheds were damaged by the earthquake, with one farmer reporting land raised up to 3 meters in some spots, Broome said. However, he says dairy farmers are coping thanks to cooperation between neighbours and the “unbelievable job” done by contractors repairing cowsheds over the weekend. Three cowsheds remain out of use. Herds are being milked at neighbouring properties where necessary. Generators have been moved around farms as power has been restored, and every cowshed in North Canterbury now has power. Dairy NZ’s acting regional leader for Canterbury, Simon Sankey, says it is unclear how milk production will be affected because damaged infrastructure will impact on the entire milking season. “So far it’s been very much about getting through. Now we’ll start assessing what needs to be done next,” he says. All of Fonterra’s manufacturing sites at Clandeboyne, Takaka, Brightwater and Kaikoura are operating and processing milk. The Plains manufacturing site received minor damage, but resumed operation on Sunday afternoon. Fonterra Spokeswoman Julia King said the use of generators and movement of cows between properties has allowed milk to be collected at normal volumes. Despite that success, Broome said early indications were that some pasture had been severely damaged by liquefaction and cracks in the ground. Some boreholes had been turned into geysers by the earthquake, and changes to underground water distribution will need to be looked at over the coming days, Broome said. Colin Glass, general manager of Dairy Holdings, New Zealand’s biggest dairy farming group with 58 farms in the South Island, said its farms emerged reasonably unscathed from the earthquake. He said four rotary cowsheds on neighbouring Dairy Holdings farms came off their platforms. Three were fixed on Sunday, and it was hoped the fourth would be operational by close of business on Monday. Water supply was another problem, but Glass said there was “no hint” of large production losses. The earthquake is further drama for Dairy Holdings, after one-third shareholder South Canterbury Finance was put into receivership last week. However, Glass said it is “very much business as usual” at the company. Dairy Holdings’ debt is comparable to others in the industry, and it was not exposed because it is held with the four trading banks (ANZ, BNZ, Westpac, ASB) , he said. “We’re largely unaffected by the changes at South Canterbury Finance. The biggest impact for us is that a 33 per cent shareholder is now in receivership. It remains to be seen how that plays out with the receivers,” he said. From an economical point of view it would be interesting to talk about world food supply and prices in general in relationship to natural events (Climate change) like droughts/ floods etc. Therefore do we see increasingly a worldwide shift in eating behaviour, because of high prices and inaffordability ? Is NZ on the right strategy with meat and milk production ? Do we need more diversity in order to be flexible and adoptable to the world demand ? Looking into these questions plus the important Green Clean, 100% pure national tourism slogan, I’m thinking there is a conflict brewing, which could become very expensive for both parties agriculture and tourism - with no winners.